After breakfast, Boris handed us over at 9 am to our guide for the morning, Nieves. Only one person, Pat, went on the excursion to the Nazca Lines. A few others stayed behind to enjoy the day on their own. Carol, Christe, Val, Sharon, Charlie, Jayme, Dale and I got on the minibus with Nieves and the driver, Marco. 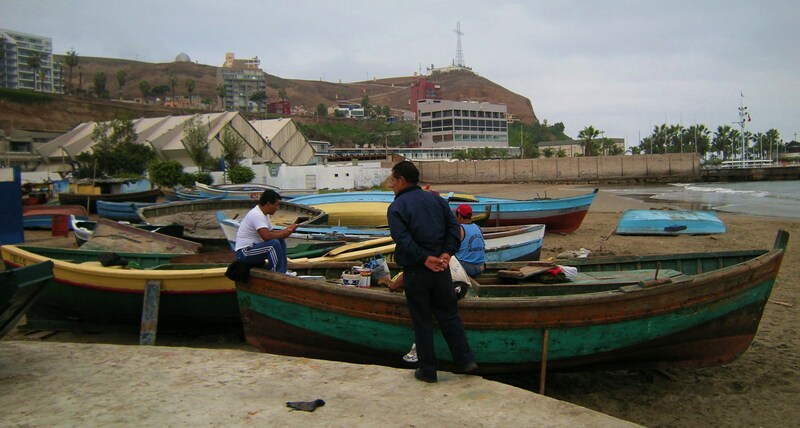 Our first stop was Chorrillos, a fishing district, whose patron saint is St. Peter. The bus descended a steep cobblestone street, then took a sharp, hairpin turn to continue down to the shore. We were told that we could take pictures, but if we took pictures of the people or their activities, they would expect to be paid S/0.50-1.00. We could share, several people taking a similar picture and pay only once. 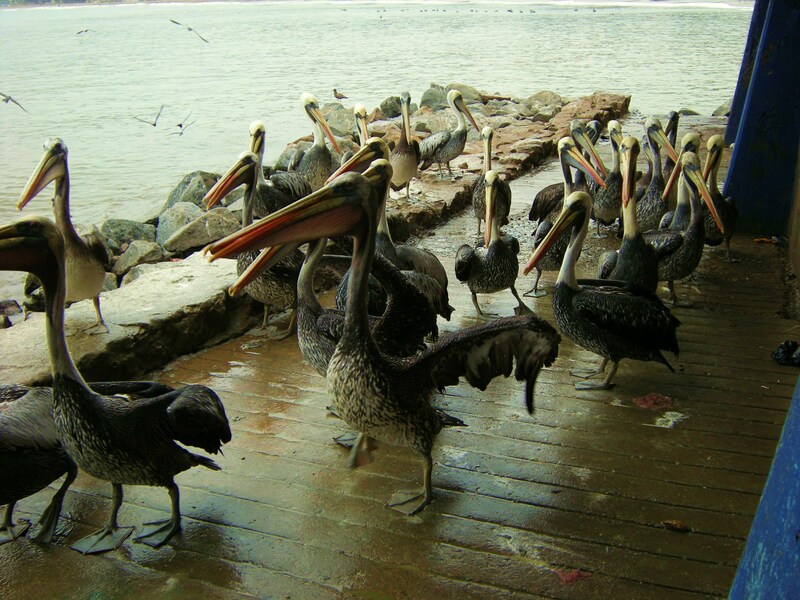 It was quite interesting: the shoreline was filled with pelicans waiting for handouts. Seagulls circled overhead for the same reason, and we also saw a black-headed vulture (not a condor!) feeding on the carrion of some animal that had white fur. 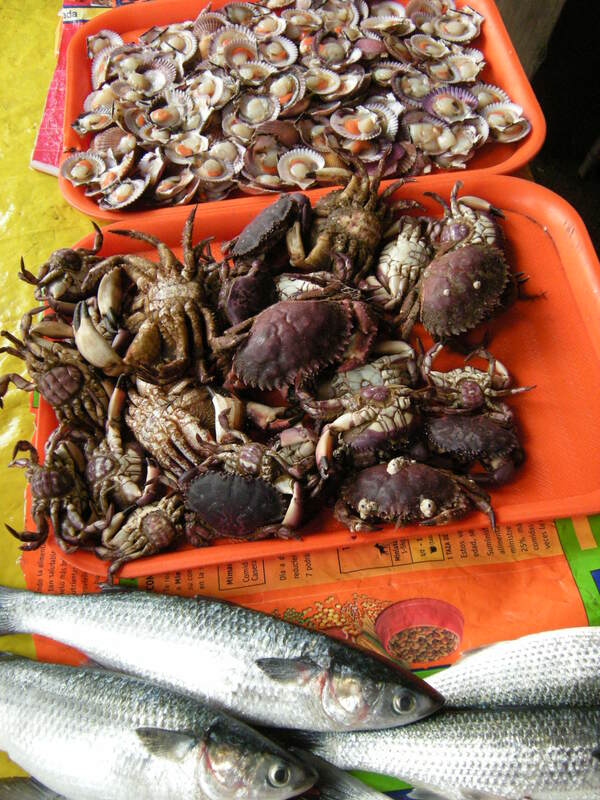 There were buckets of fishermen’s catch: small hard-shelled and soft-shelled crabs which crawled on your hand (one vat was teeming with them! 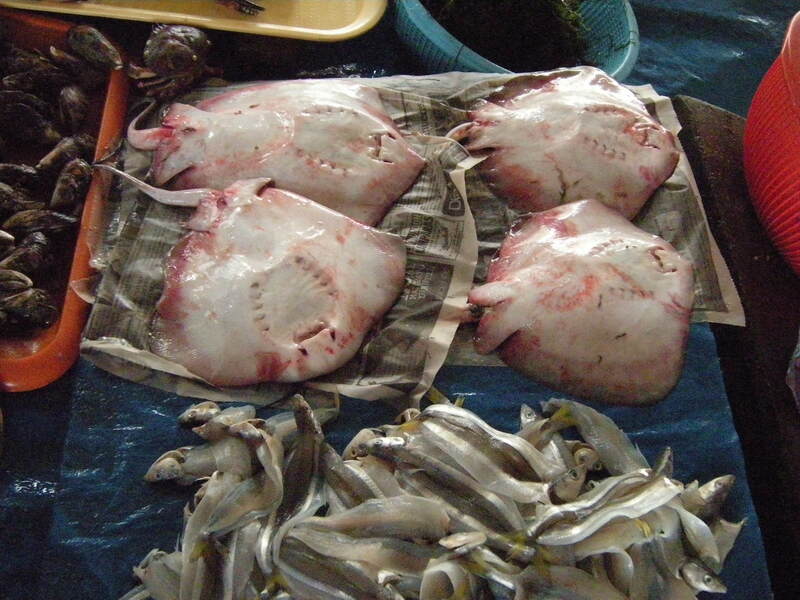 ), several ugly white-bellied rays, and frog fish, among others. Frog fish have suckers on their bellies which allow them to cling to rocks underwater. 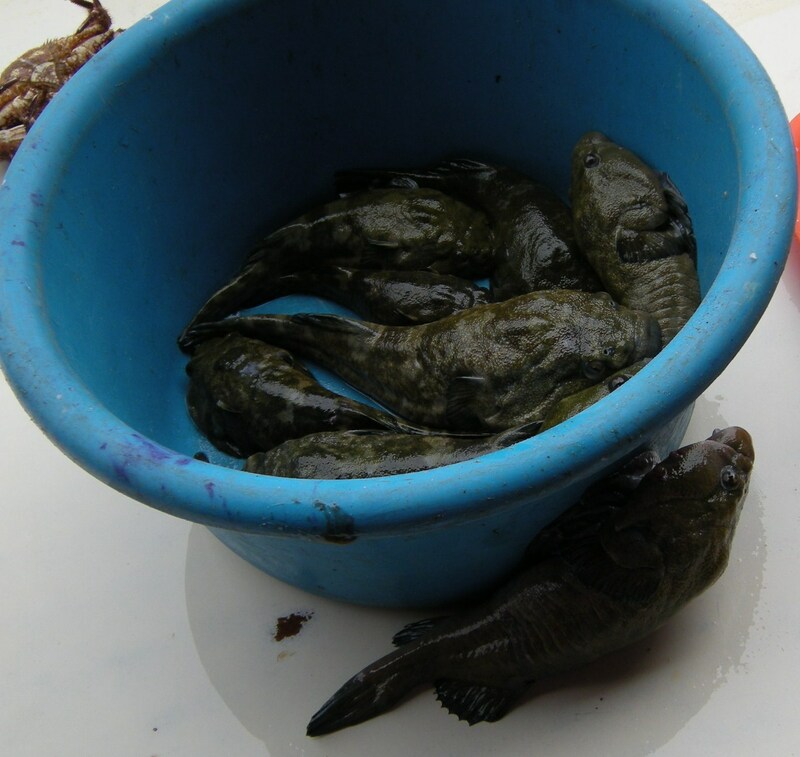 Even when caught, it can breathe, because in its natural environment, it would sometimes be submerged, sometimes not, so has developed the adaptation of breathing for a short time out of the water. 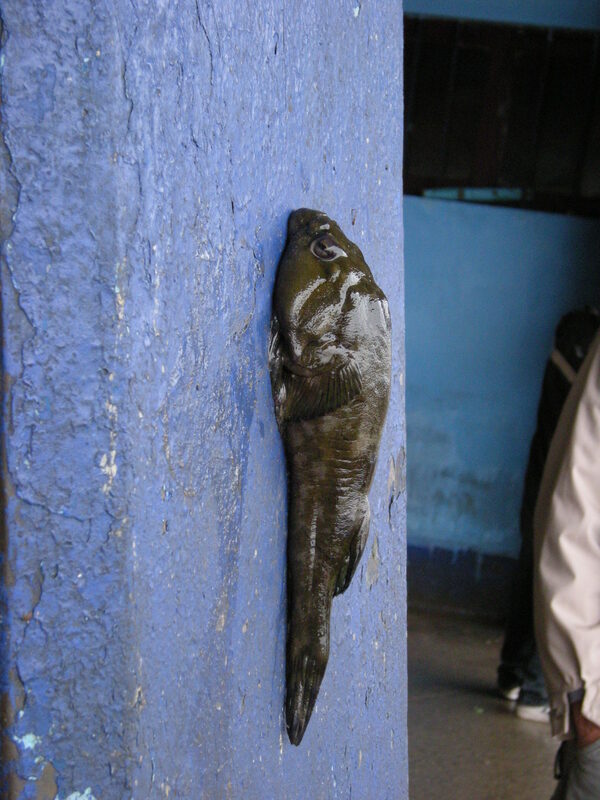 One of the fishermen took one of these fish and stuck it on a post to show us! 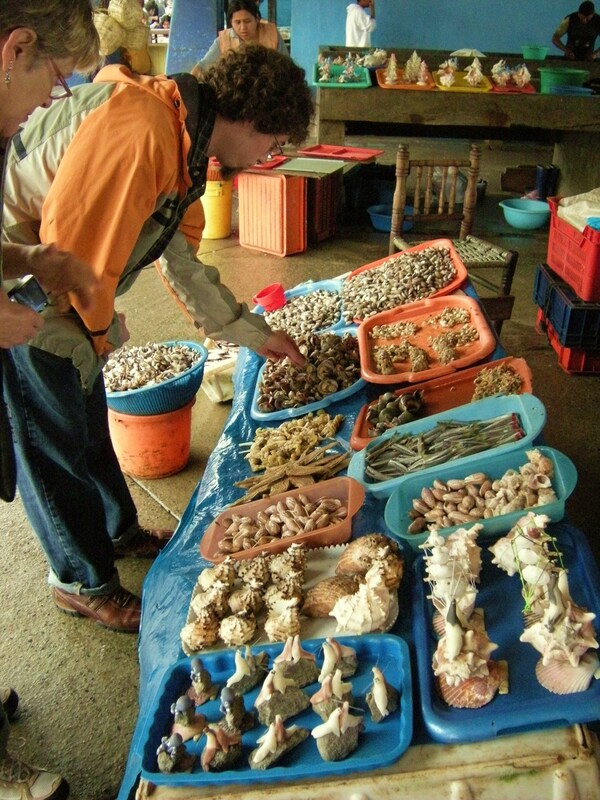 Jayme and I went back to buy shells which were being sold for a few soles. 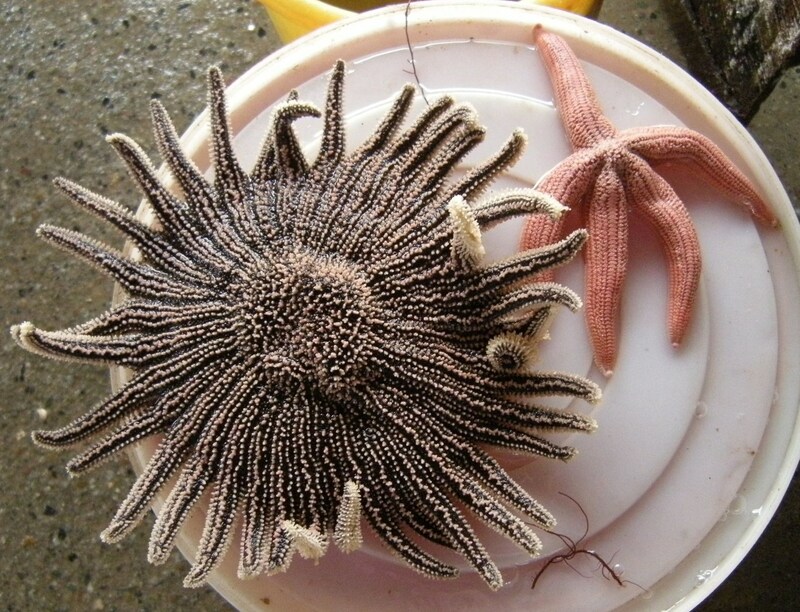 The woman selling them had a pail containing regular and “girasol” (sunflower) starfish. She got one of each out so I could take a picture. The girasol had many limbs but was related to the regular starfish. 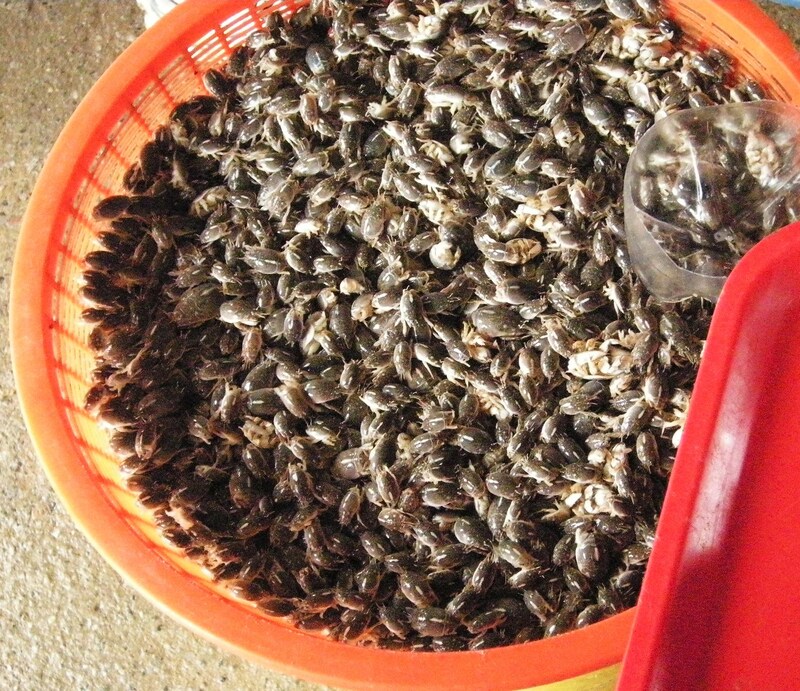 She also had a pile of dried starfish for sale. 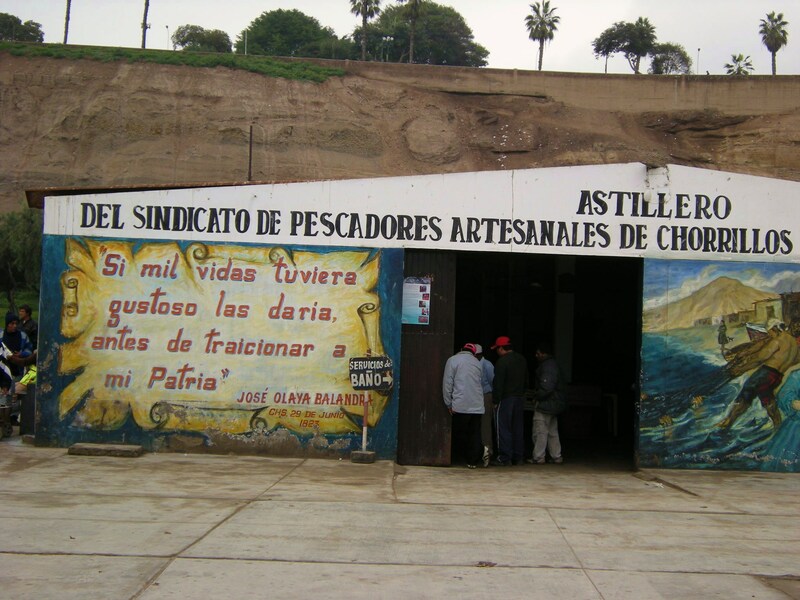 Nieves purchases some “mariscos” (mussels) for the people we were going to visit. 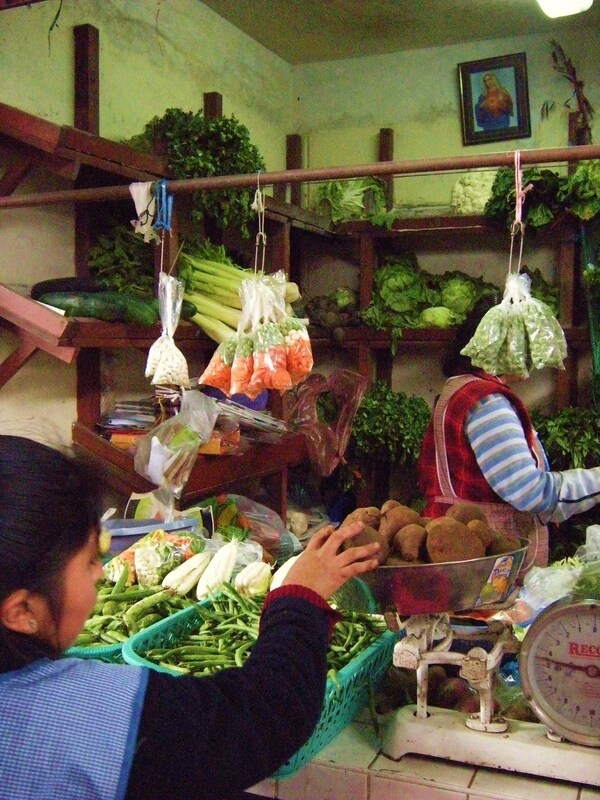 Then we headed to a food market. 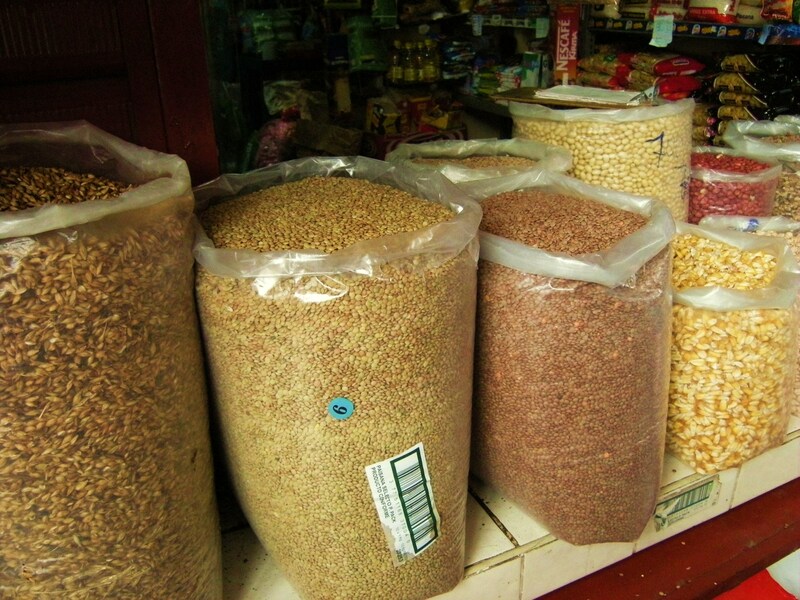 This place was interesting too – stalls with open bags full of vegetables, grains and seeds, some recognizable, some not. 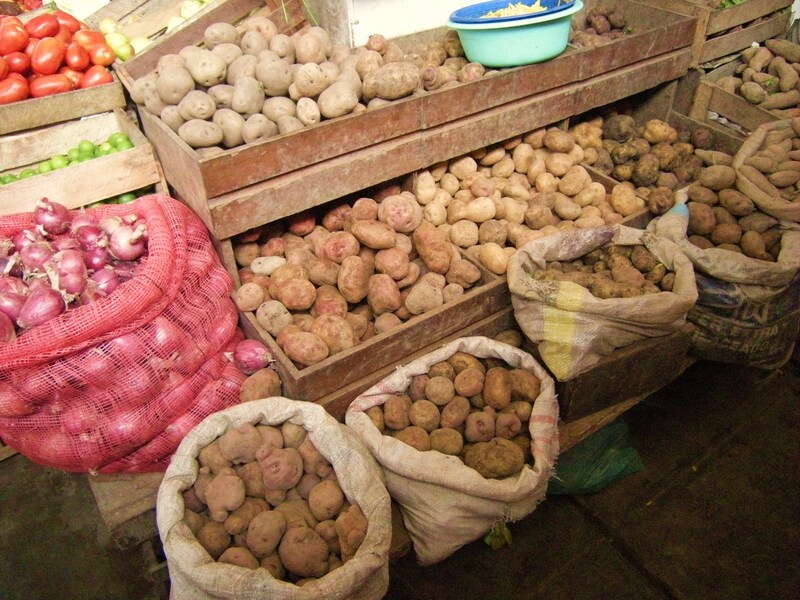 I took a picture of a stall selling several varieties of potato. 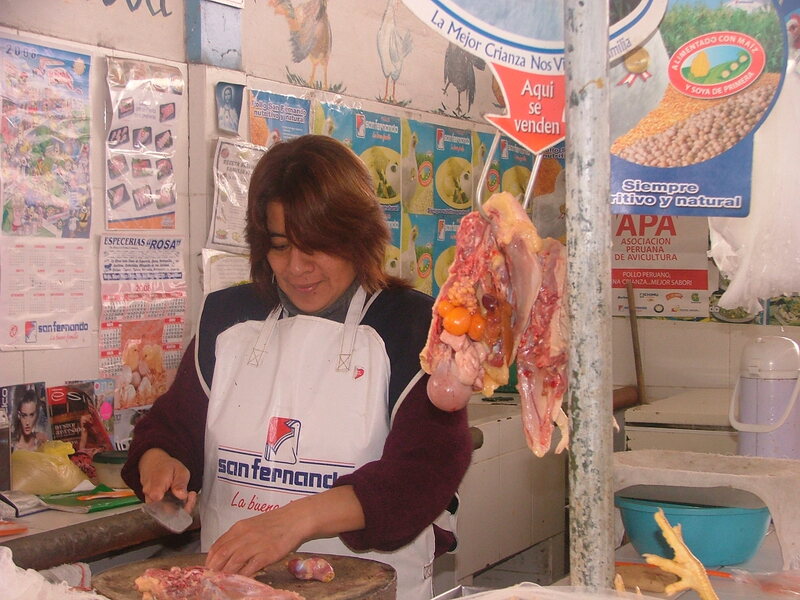 At a stall selling chicken, one chicken was hung up with all its innards exposed – lives, lungs, intestines, even large testicles! 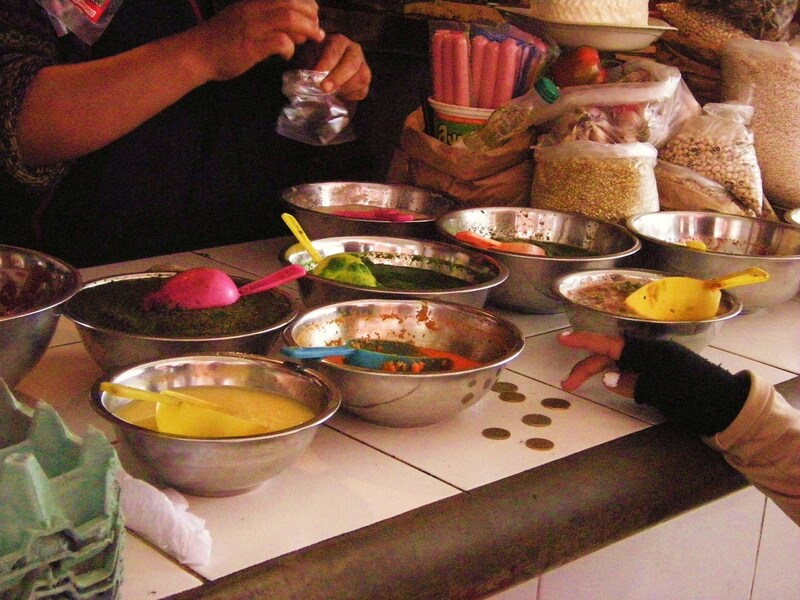 Another stall sold various kinds of sauces – green, red, yellow-white salsas and moles. You could try them with small sticks and then make a choice. 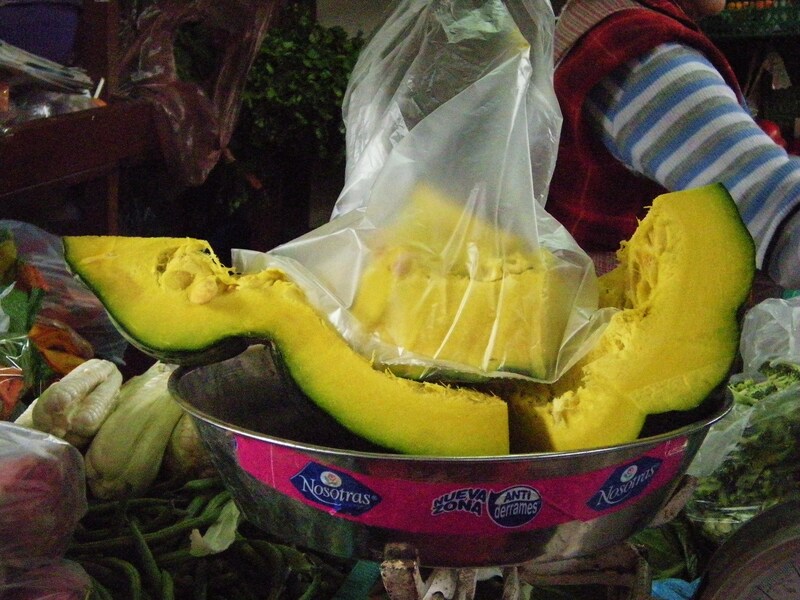 The vendor would spoon one’s purchase into a leak-proof plastic bag and tie it at the top. Afterwards we went to the back where we paid S/0.50 for a small wad of toilet paper and we went into the stalls of the bathroom to squat on seat-less toilets. Then we were on our way to Villa El Salvador. 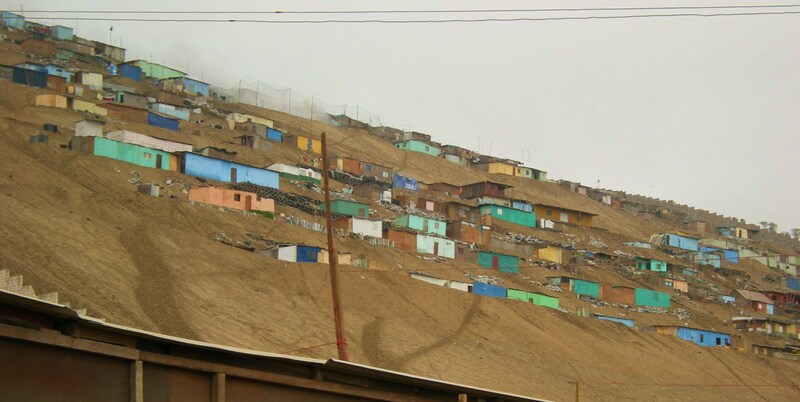 This shantytown spreads out on a sandy hillside on the outskirts of Lima. 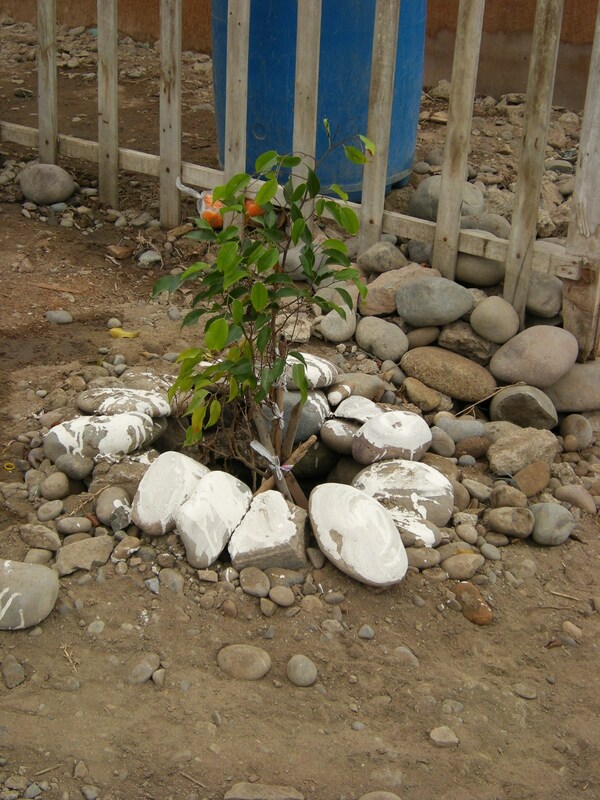 Villa El Salvador has a total population of about 350,000, but there are 3 stages. Stage 1 is the most recent arrivals and the poorest. Stage 2 is the middle stage. 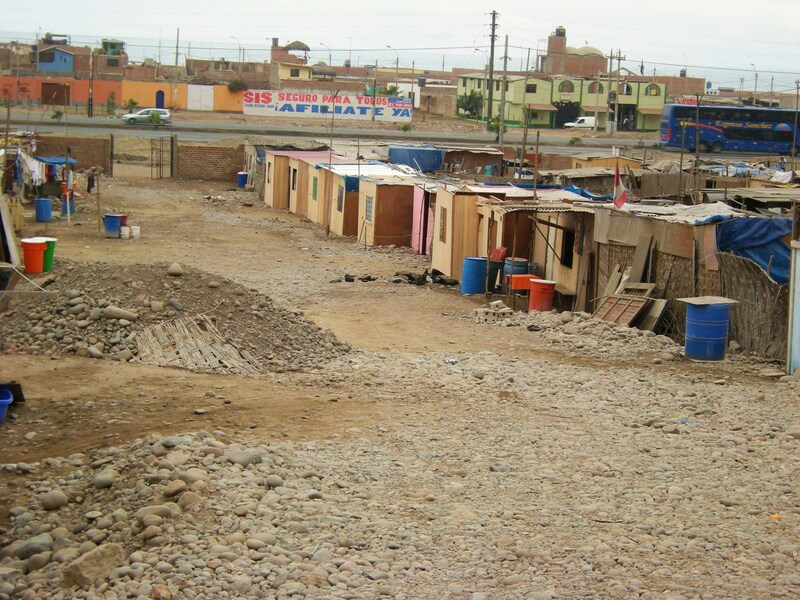 Some of these people have built more permanent structures of brick and have water tanks on top of their houses. They have dirt roads still, but somewhat more infrastructure. The biggest group lives in Stage 3. These residents have been there the longest, more than 35 years. The main streets of that section are paved; there are even some traffic lights and a lot of thriving businesses. 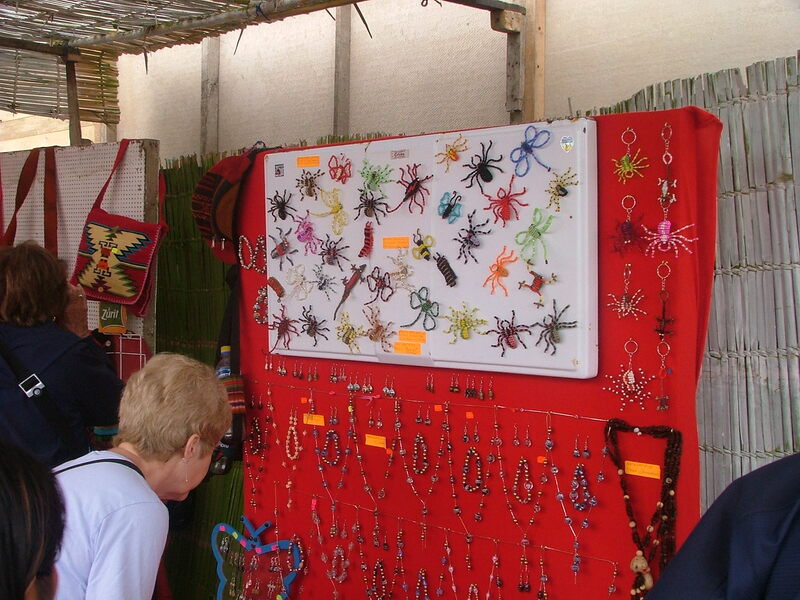 People come from all over to buy things there because the goods are cheaper, have more designs (for example furniture) and the work is good quality. We drove through Stage 2 and 3 but our real visit was to the Stage 1 group. 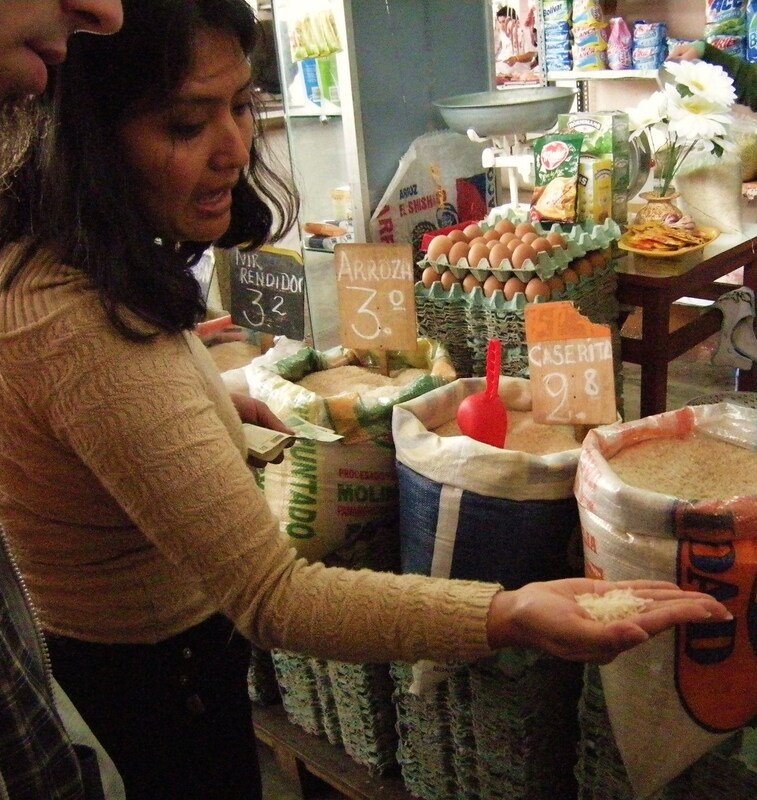 Nieves takes OAT groups there often. 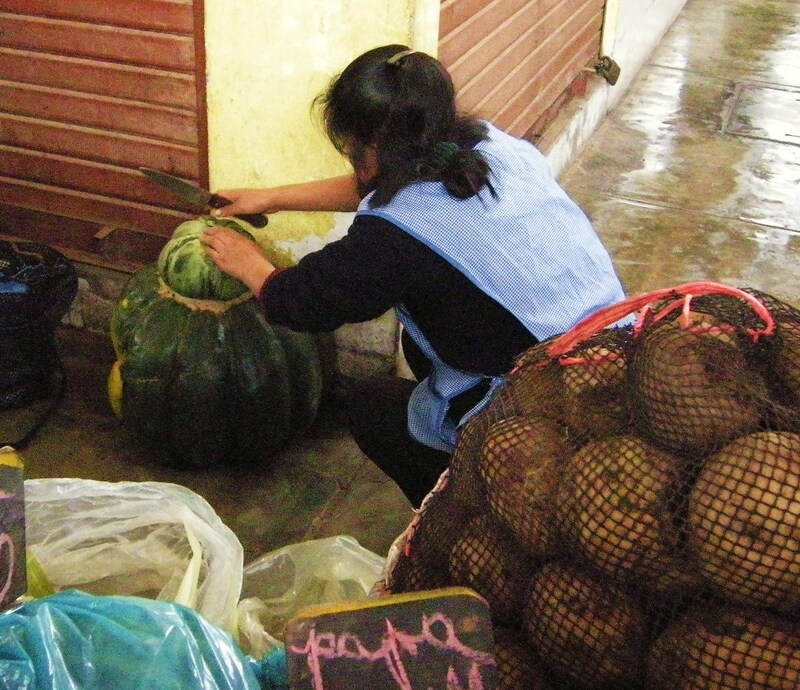 At the food market, Nieves had budgeted a certain amount to spend for the residents of Villa El Salvador. 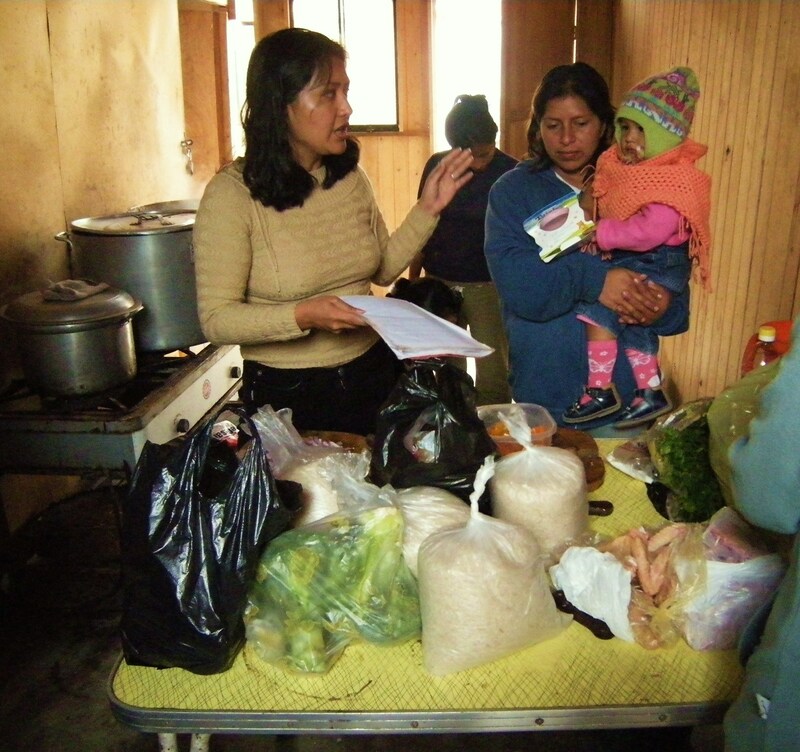 However, several of us pitched in more, so she was able to buy 3 large bags of rice and more vegetables ‘ squash, broccoli, potatoes, beans, and a lot of other food. 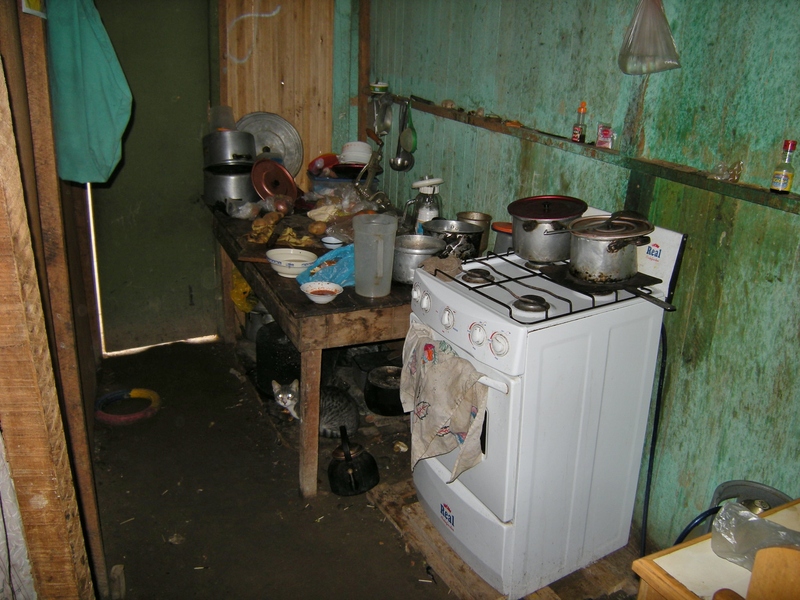 In Stage 1, there is a community kitchen. Volunteers do the cooking to feed the 80 families living there. They were very happy to receive the food we brought, because their government subsidy of rice and oil was cut off in June because one of the leaders accused them of not sharing the food. Hopefully they’ll get it back in July. 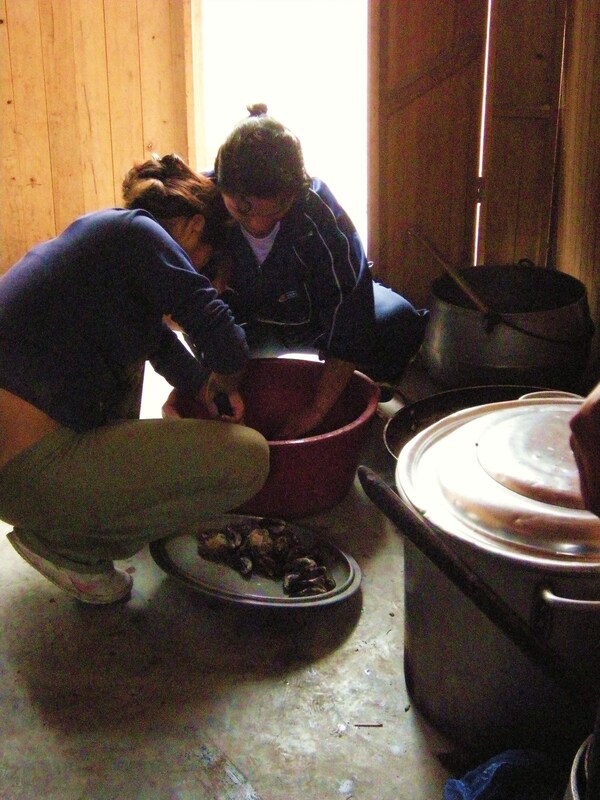 They used the mussels and all the vegetables for the pots of stew and soup they were making. 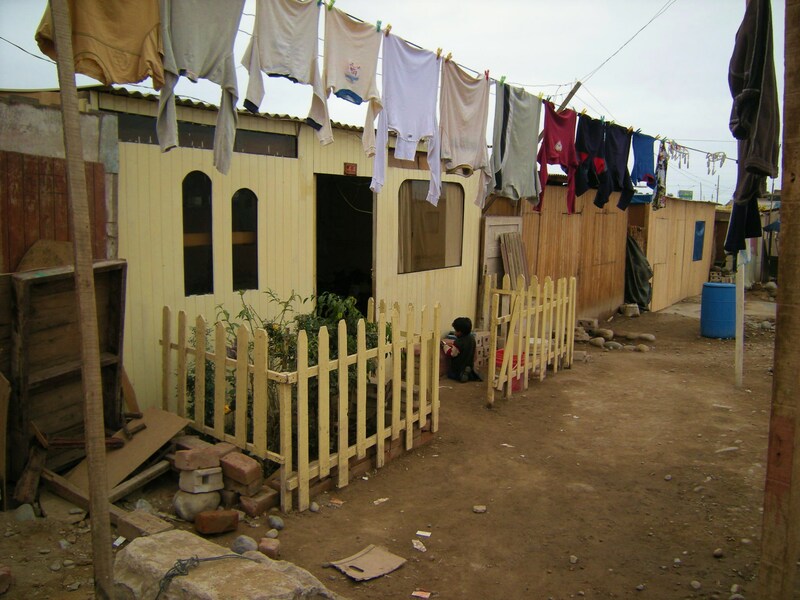 People who live in shantytowns do not own the land, but are basically squatters. 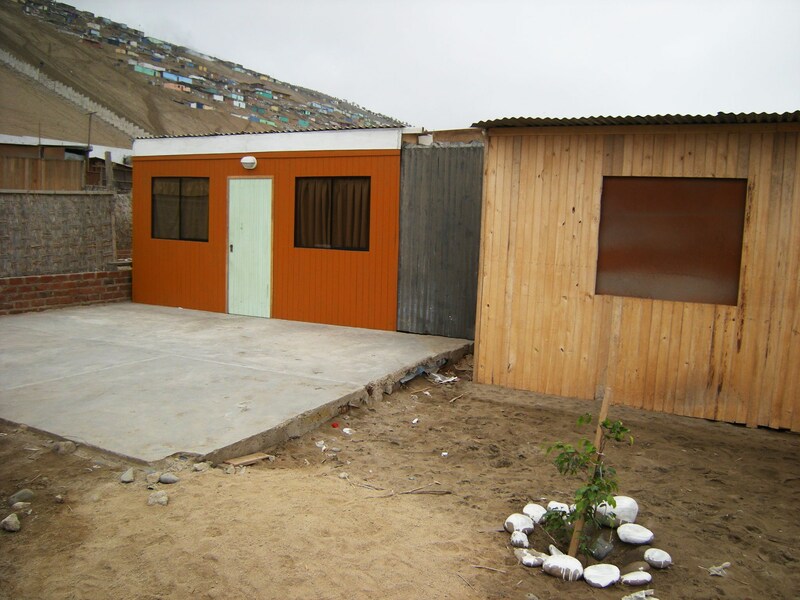 The shantytown of Villa El Salvador shows what a community can accomplish when the residents are able to create an infrastructure and start their own businesses with the help of good leaders. In Stage 3, there is electricity, water, etc. 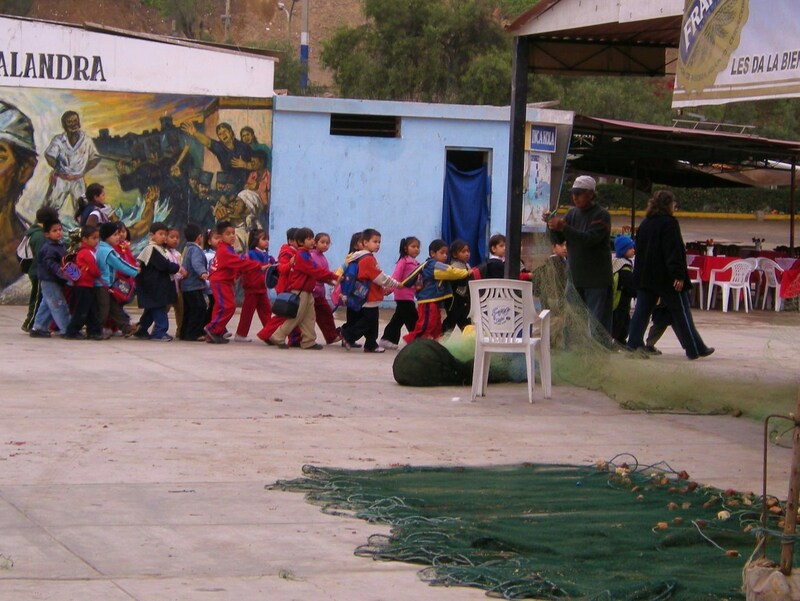 in Stage 1, there is very rudimentary electricity, but no water (they have to go collect water from a well and carry it back, or collect the scant rainwater that falls in Lima). 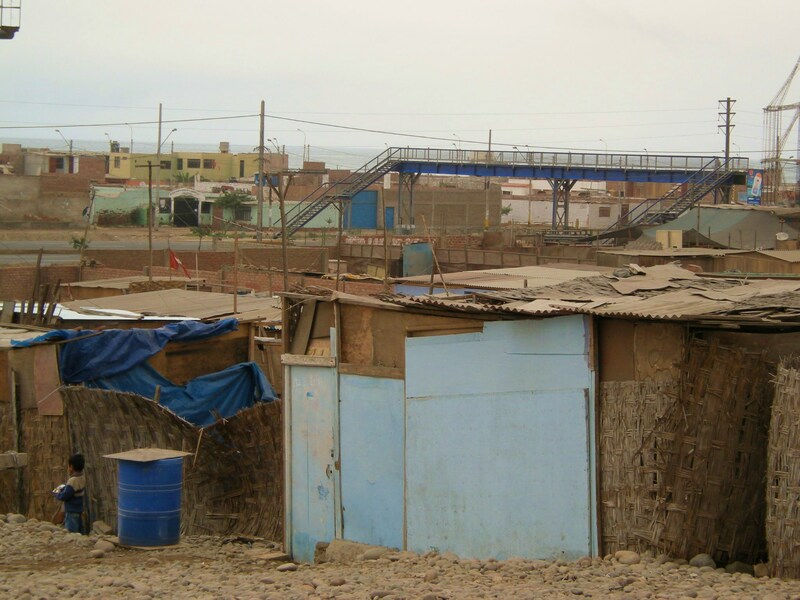 Some people in Stage 1 have built homes out of plywood, reeds, plastic, scrap sheet metal, etc. 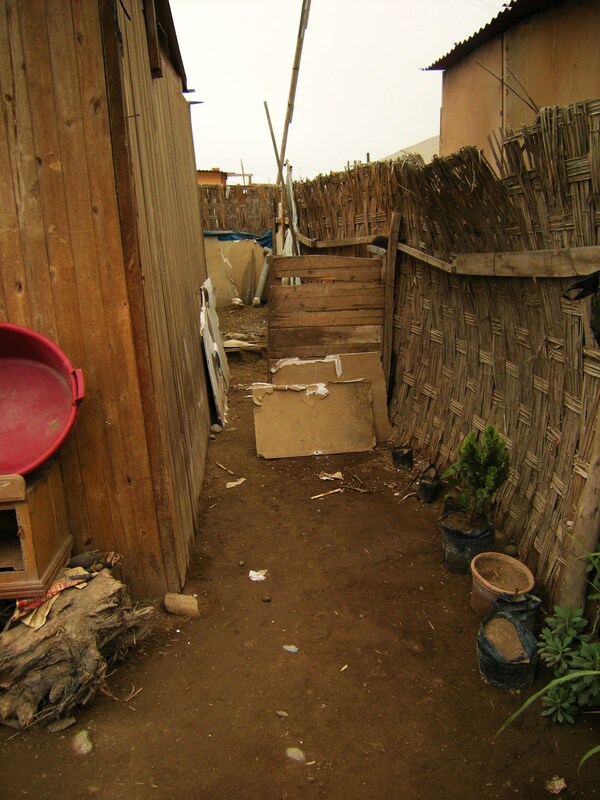 They try to beautify with a few plants and if they’re lucky they have a courtyard to do laundry out back and a few animals. We also went to the house of a 74 year old woman named Evarista. Her house is very dark because she has no windows, but there is a dusty courtyard in the back. Her husband is 78 years old and was not there because he has to go out and work. 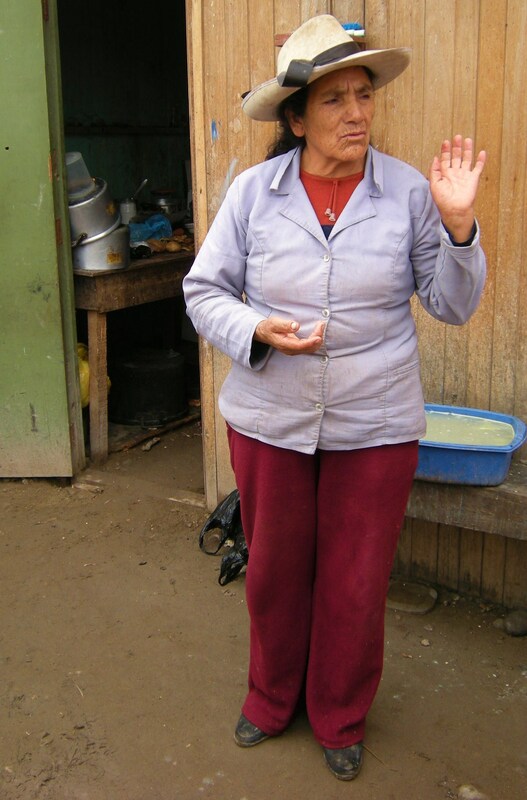 Evarista and her husband came from a small rural community in the highlands. 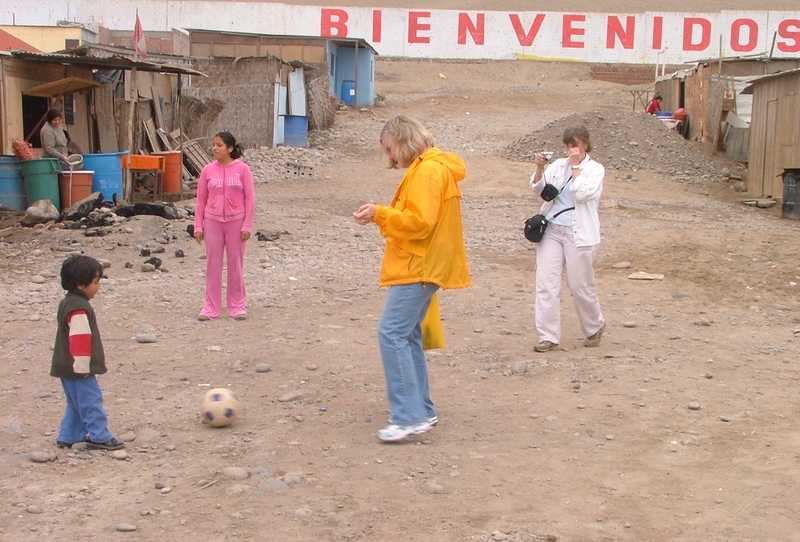 They moved to Lima for only one reason: all their children live there. 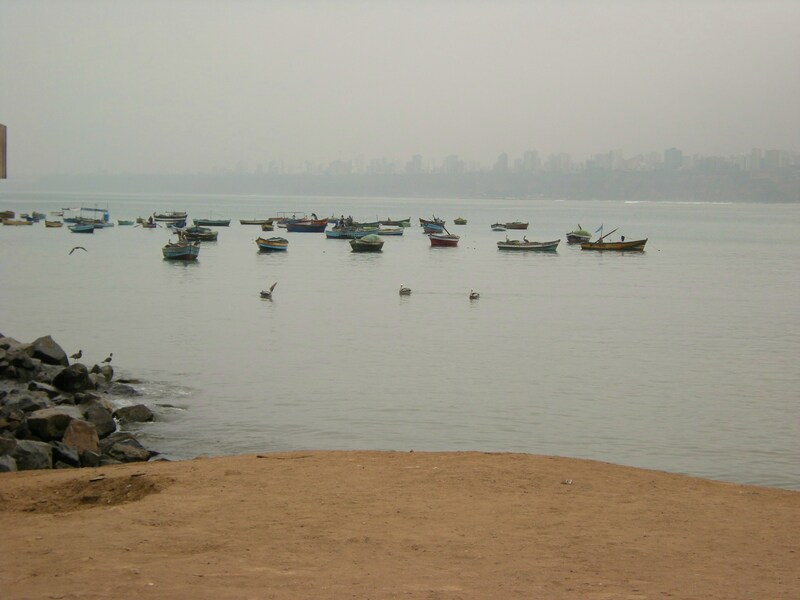 However, Evarista is very unhappy and cried as she recalled the life in her village and the fact that her husband didn’t have to work anymore when they were there. 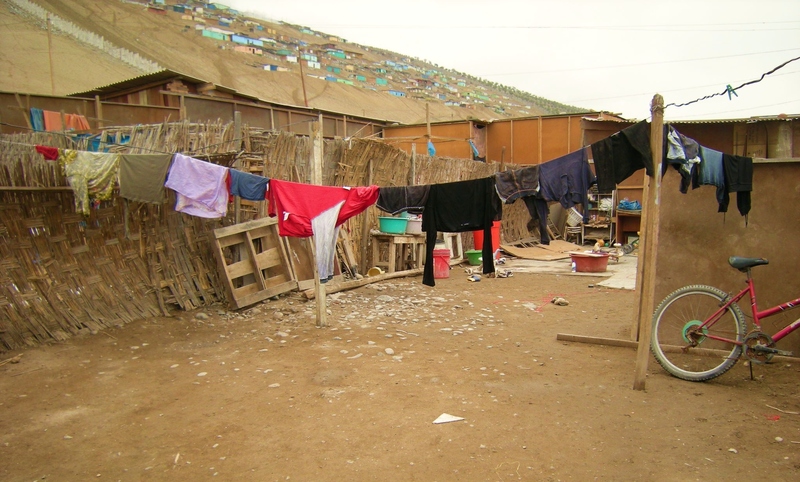 One of Evarista´s children lives in the shantytown with her children; the others live elsewhere in Lima. 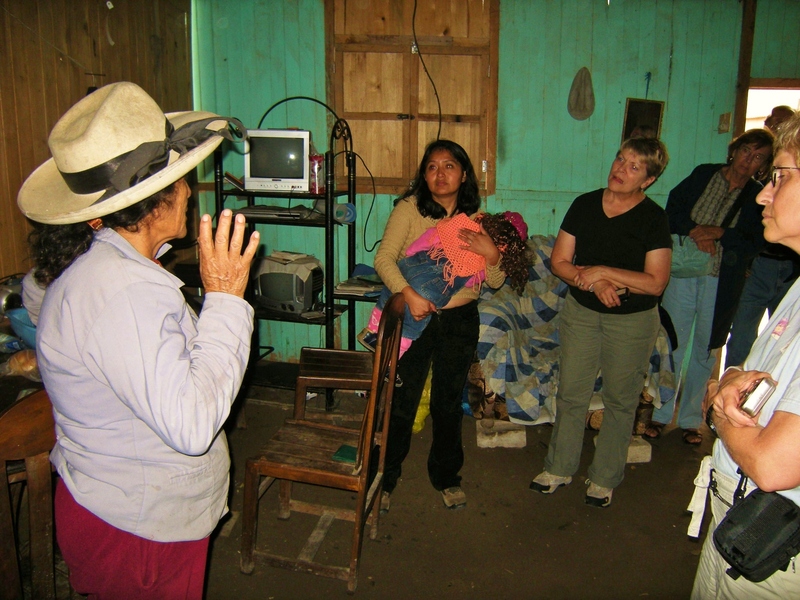 Her children pooled their resources to buy her a small stove. She has an electric bulb connected to a bare wire that also connects her TV and clock. After we visited her, we went to the craft workshop that the residents have. 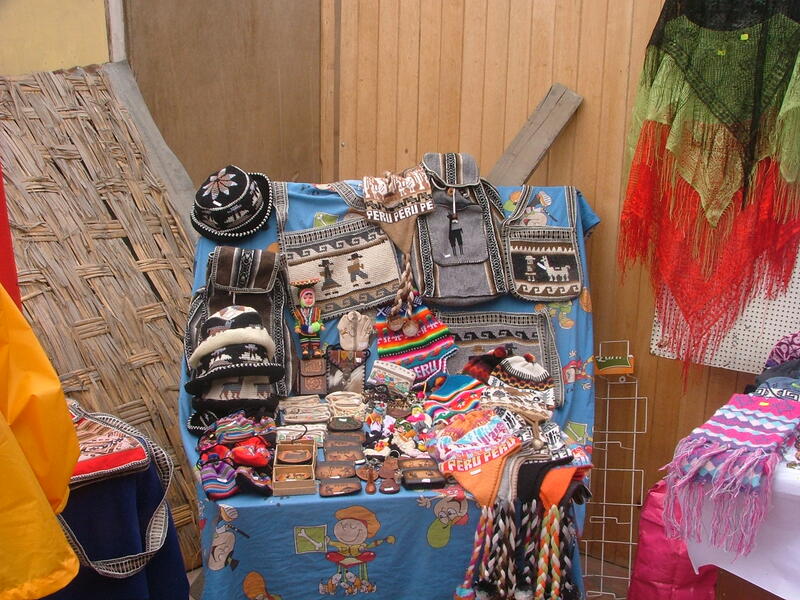 They make crafts to sell to their visitors which consist only of OAT groups that come every week. 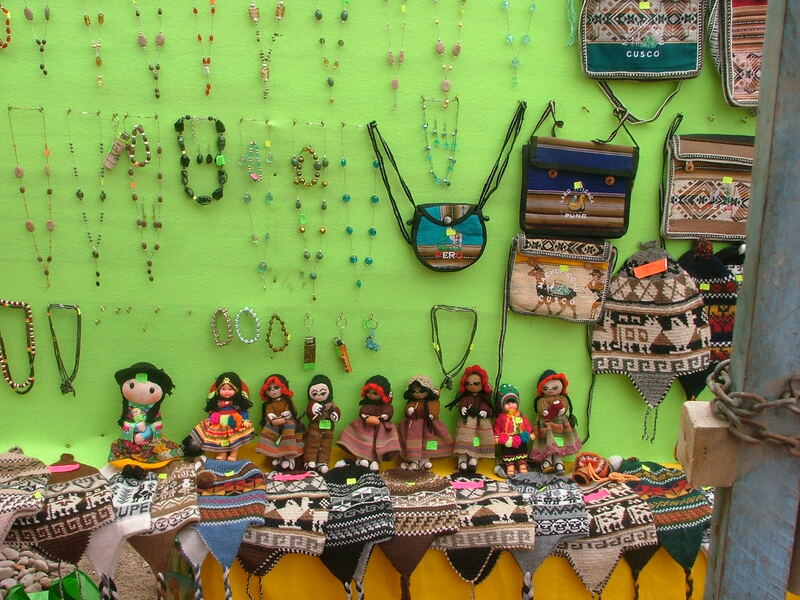 I bought several things there, including cute little finger puppets of animals, a water bottle holder and a purse. Others spent money there too. One of the women from the community told me they are very grateful to us for buying their goods, because it allows mothers who have children to not have to leave their kids behind to go to work, but instead can work and make their living in the workshop. While I waited for the others to finish shopping, I played soccer with two very cute little boys, aged about 3 and 4. The younger one soon got tired of playing ball and preferred to throw dirt and watch it filter out of his hands and blow in the breeze. The older boy, extremely cute, kept up the ball game, but after awhile picked up the ball and threw it to me instead of kicking it! After we left, all of us felt humbled by these people and their lives. 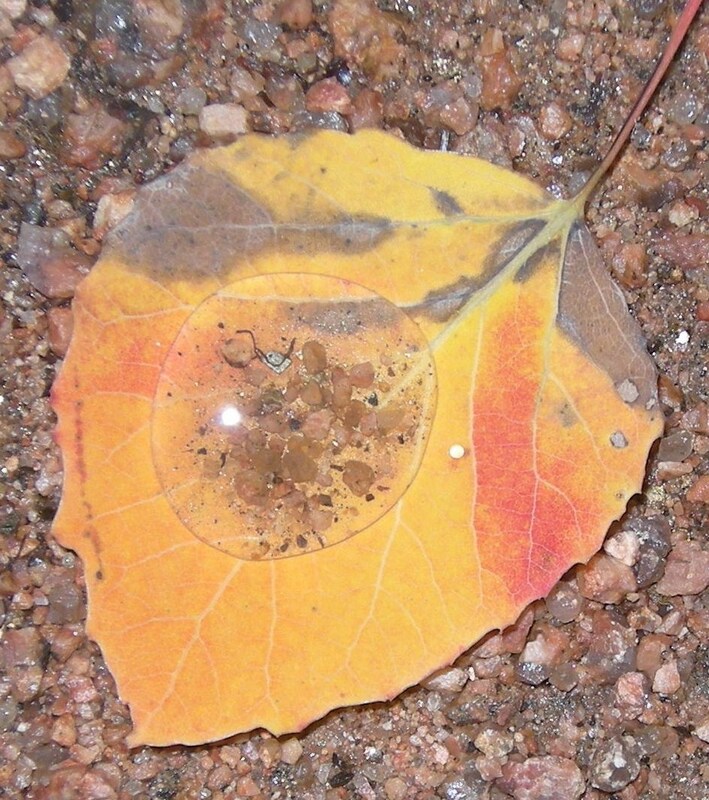 We have so much and they so little, and basically they are invisible to almost everyone. But they keep trying to make their living and improving themselves, and every day is a struggle. 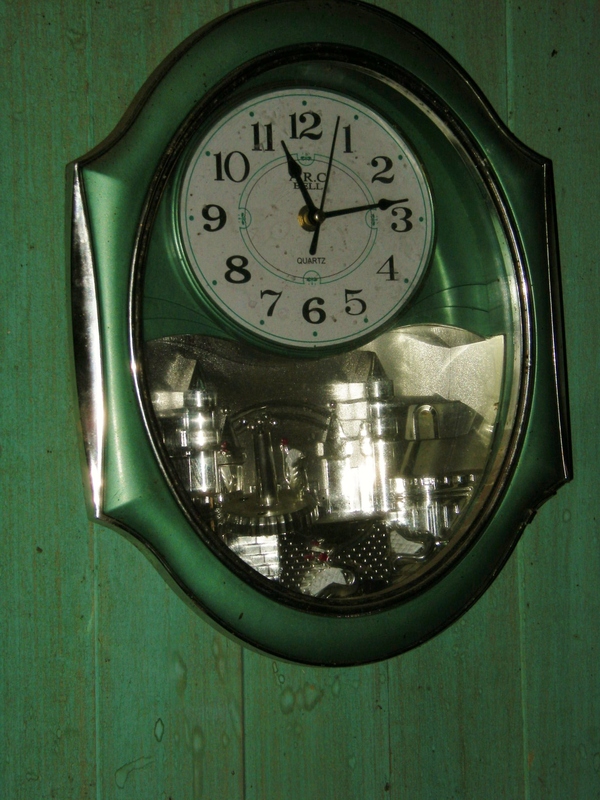 Lunch and afternoon were on our own – kind of a waste, because we didn’t plan and choose well. 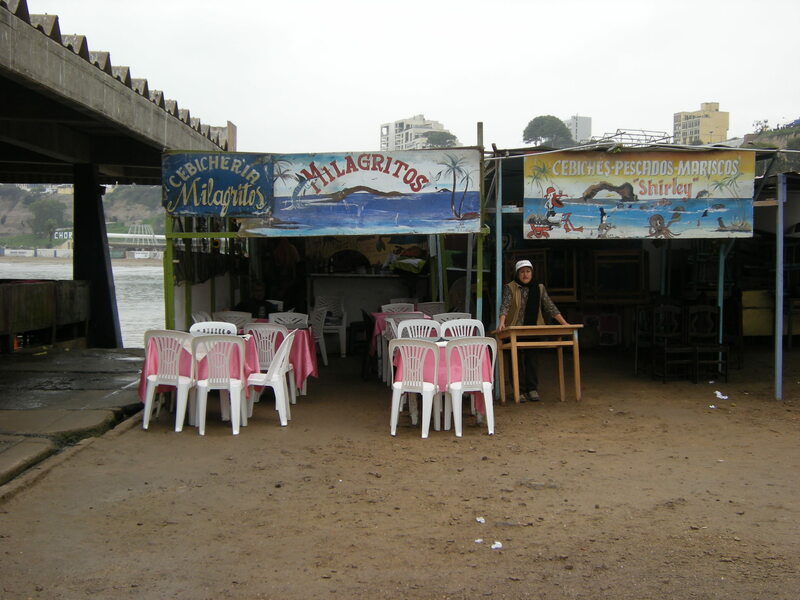 Dale, Jayme and I ended up eating at a cafeteria in downtown Miraflores district – mediocre food and choices. We had empanadas and some kind of juice. 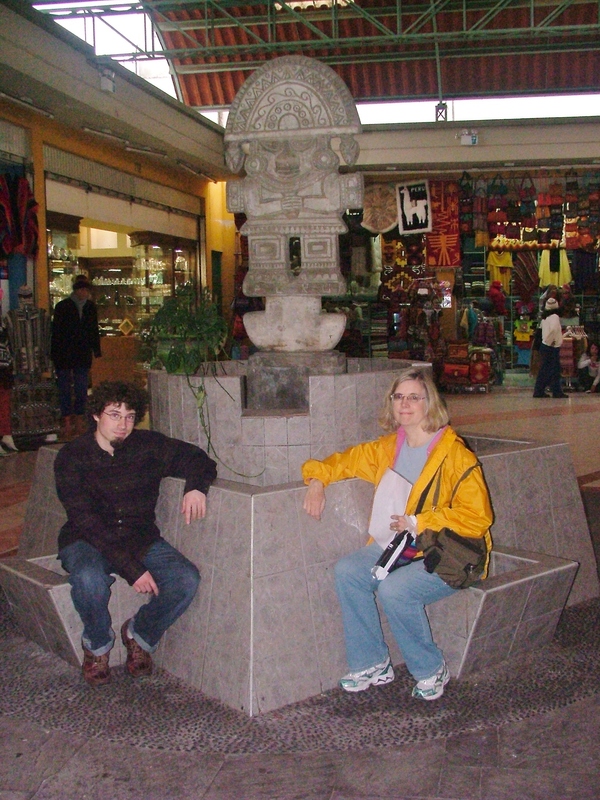 There was a museum I kind of wanted to see, but instead we went to an “Indian market” – what a bust! Big tourist trap, and everything in one shop was just like all the others. Nothing very original or unique. Dinner that night was at Costa Verde, an elegant restaurant overlooking the ocean, at Larcomar mall also. It was excellent, both food and atmosphere. We heard about Pat’s trip to see the Nazca lines. These are giant pictures carved in the soil by pre-Incan peoples. The pictures can only be seen from the air because they are so large. These pictures were made for the gods. The way they were made is by removing the topsoil, which is darker, revealing a lighter sandy soil underneath. 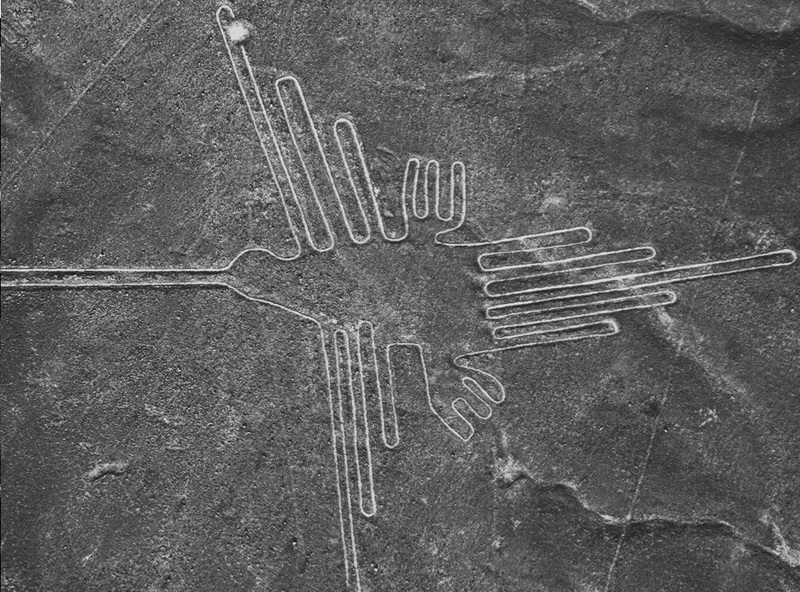 Some ethnocentric white person wrote a book about this a few decades ago, saying that the Nazca people must have had contact with extraterrestrials, because otherwise how could they know what the drawings would look like? 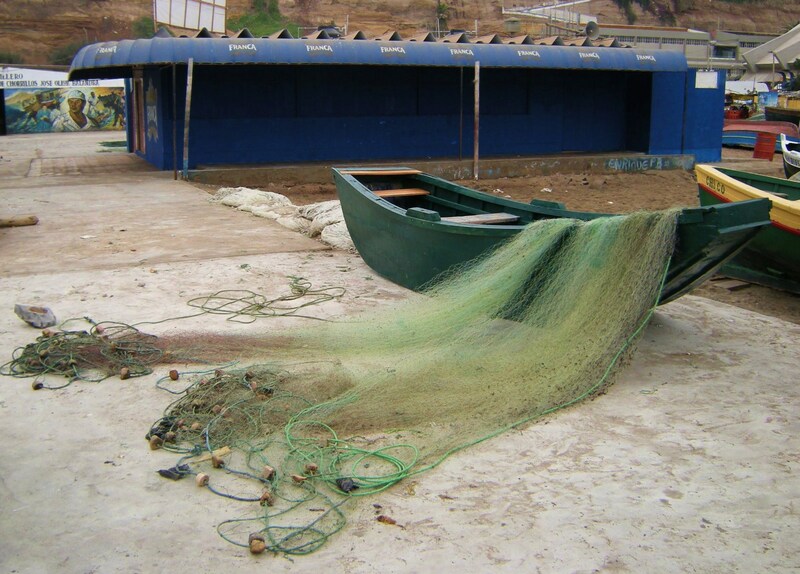 That author grossly underestimated the ingenuity, artistry and calculative ability of these native Peruvians. 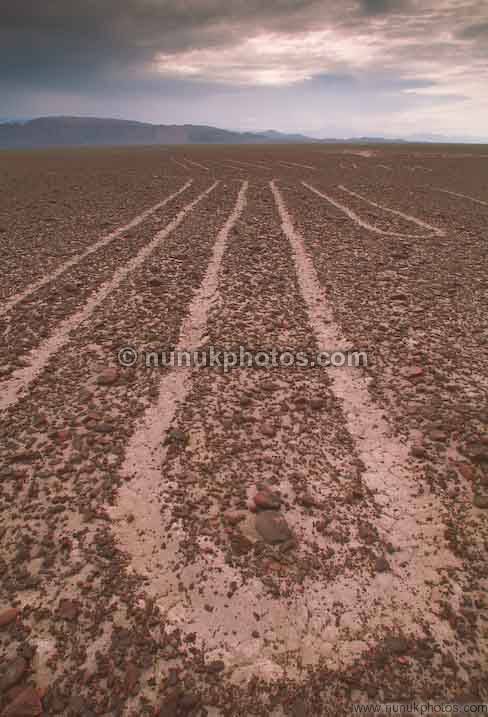 Note: Pictures of Nazca Lines were downloaded from Google Images.